What books are you reading this Summer!! Isn't Mary Kay Andrews just the best! I was so lucky to meet her last week and go junkin with her. You can see the post on my blog. I have all her books and love them. I will have to see if I can find this book you won! Congrats! Conngrats on winning the book. You've always been a winner in my mind. This summer I plan to re-read ATLAS SHRUGGED. Oh, and thank you for your support and kind words. I have read all of MaryKay's books except the latest one, The Fixer Upper. I've got to get it for sure. Congrats on your win and I hope you enjoy the new book. I'll have to check out this author. Congrats on your lucky win! So glad you enjoyed it. Nerina, I've not read her books, but I'll look for them. Thanks for the recommendation. Congratulations on winning! Looks like you won with the sea glass too. I'm amazed that you found all of that at one time. I always look for sea glass but rarely find any. 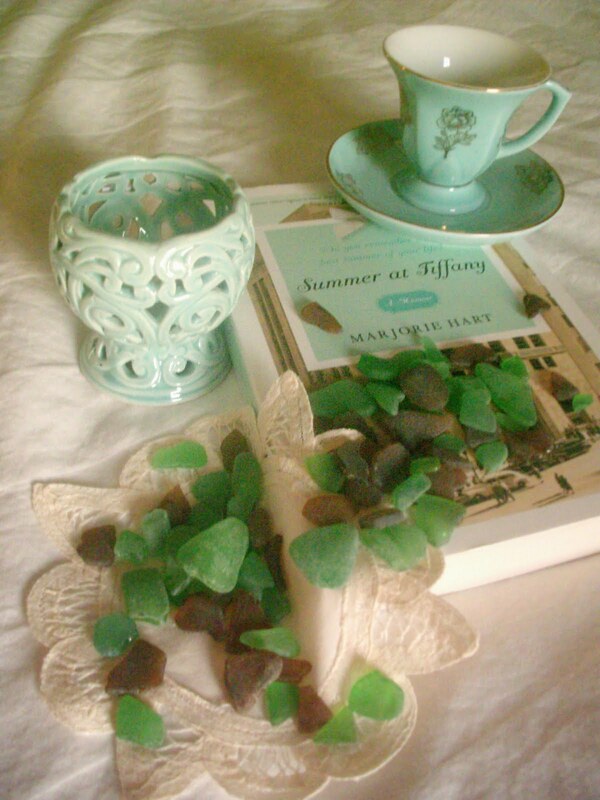 I read a book years ago, Sea Glass by Anita Shreve. You might enjoy it. Mary Kay Andrews has a blog??? I had no idea! I've read a couple of her books, and always meant to read the rest of them. Congrats on your win! Thanks for the recommendation! I have several books to read but haven't started yet. I will tell you that a favorite book I read last summer is called The Help by Kathryn Stockett. It's an incredible book. When I was talking about it last weekend, two women said that they were reading it right now! It's so good. Oh, you found all this beach glass -wow! And congrats...! When it comes to books, you always find me in the "self help" isle, haha. So I just finished reading "Ask and it is given" by Esther and Jerry Hicks. love, love, love MKA! Reading her books has made me fall in "fantasy love" with the south, which in turn lead me to another great Southern writer, Dorothea Benton Frank. I soooooo want to visit the Outer Banks! How exciting for you to win her blog contest!!! Dog Days of Summer !! Happy Fourth of July Friends !! Happy 143rd Birthday Canada ! !